Social Logins are becoming increasingly popular across web applications, they not only offer good user experience are safe and also saves the user from password fatigue. Imagine losing a customer because they can not log on to the application as they cannot remember a password are not bothered to reset passwords etc. A social login is a kind of single sign-on where you use login information of a social network like Facebook, Twitter, Google+ to log on to a third website, instead of creating a new log-in account specially for that website. Earlier I have written few blogs about Spring-Social features where I had written about few problems like no support for Google, only one user allowed by spring-social etc and also few exceptions which occur and then how to fix them.I thought of collating all the problems and writing a step by step tutorial explaining in detail, on how to register a user using spring social. In this first part of the tutorial, our aim will be to get data from spring-social and then display the details on the page, in the second part we will integrate the spring-security where we will ask the user to enter his details and then store on DB. Assuming that you know how to create a simple spring boot project, let us move on to add maven-dependencies required to run the project. If not, then you can create a spring-starter project and add thymleaf and web support. In case you get the repository not available error, you might have to add the following repository to your pom. To make our web pages look nice we will add some Bootstrap CSS, Font-awesome and Jquery to them and also we will use thymleaf for HTML. Read Here if you want to know more in detail. To start we will create a view which will have 3 buttons each for Google, Facebook and Login. When the user will click on any of them he will be asked for authorization for the selected provider, upon verification his details will be rendered on the page. Let us create a controller class called LoginController in package com.login.controller with a simple method which will map the above page to URL / or /login. Now run the above application and at this point, a page like this should appear and of course, it won’t do anything yet. 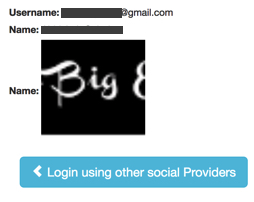 Once we verify the user via our social provider, we will show the user details on another page. We can store these details in a POJO called UserBean. For Facebook, Google and LinkedIn we will create a Provider class which will be used to do authentication and save user details to the UserBean, which can be later displayed on the page. To start off with we will create a BaseProvider which will have a constructor where all the providers will be initialized. This BaseProvider is created by injecting the Facebook, Google, LinkedIn and ConnectionRepository repository. These objects are a reference to Spring Social’s Facebook, Google, LinkedIn and ConnectionRepository API binding. We will use the below Facebook provider to authorize the user and then access Facebook Data. We will save the fetched user data into our UserBean. We will use the below google provider to authorize the user and then access Google Data. We will save the fetched user data into our UserBean. We will use the below LinkedIn provider to authorize the user and then accessLinkedIn Data. We will save the fetched user data into our UserBean. Spring social do have a spring-social-google project but it doesn’t have autoconfiguration for Google. So google authorization doesn’t work with spring boot autoconfigure straight away. In the same package add the below class, this is needed so when we add secret keys in properties file for google. We wont see any error. The Views are predefined so the user flow is login.html -> connect/facebookConnected.html by default, irrespective of what our submit URL is, the facebook will override the flow and redirect you to connect/facebookConnected.html. If you test the Spring Facebook example, accessing FB data you will realise that it only supports one user. So when the first users log in to Facebook, only his details will be shared across all new sessions/users and they won’t be asked for any kind of authentication. One of the forum says that this example is supposed to demonstrate what can be done and is not intended for production use. To fix this problem you need to override a method which always returns a string called “anonymous”.The solution is to override the “anonymous” as the UserId for each new user/session. So for each session, we can simply return a SessionID, however, it may not be unique enough to identify users, especially if it’sh being cached or stored somewhere in a connection database. Assuming that you know how to register the API and public/private keys on Google/FB and LinkedIn for this example purpose you can use the below properties file. Now run the Project and access the application on http://localhost:3000/login. You should be greeted by an authentication popup depending upon your provider selected and then you should be redirected to the page where your username, name, profile image will be displayed as below. Spring Social API helps us in implementing an authentication mechanism with social providers. It is easy to use and we have seen how to configure it to tailor it to our needs. In the next part we will use spring-security to register users and then only allow logged in users to navigate to secure pages. The link has been provided below for second part. Hi Abhi, thanks a lot for taking up the time to write such a great tutorial. I am able to set up the facebook login but the google login does not work. To be precise, it works till Step 6 (changing the default workflow). After I sign in at google I am being redirectied to connect/googleConnect instead to /google. I have even copy/pasted Your ChangeDefaultFlowController from Github. I do not understand why it works for Facebook but not for google. Would be very thankful to You if You could give me some pointers. Parameter 0 of constructor in com.example.demo.controller.ChangeDefaultFlowController required a bean of type ‘org.springframework.social.connect.ConnectionFactoryLocator’ that could not be found. Consider defining a bean of type ‘org.springframework.social.connect.ConnectionFactoryLocator’ in your configuration. It seems the injection is not working. I tried to use your social facebook version (even with your defined repository), but it didn’t work. I am using social-facebook 2.0.3.RELEASE.